June has a Prom theme and features 2 soft toys, two bags of treats, and burger chew. Their box lining was pretty dang cute, too. They always include a card. On here, you’ll see variations of toys your pup could have received – accompanied, typically, by some type of social media contest. This month includes a pop-out bow tie and corsage! Buckles tried to rock it, and let’s be honest – he does, but he was more concerned with what was inside. He was ready to go! The first toy of the month is a little stuffed camera. It has a t-shirt rope end as well – plus, when it’s torn open, there’s a bonus little film roll soft toy inside that has a spiky ball core – lots of layers here. Buckles LOVES Gene The Gentleman! Gene comes equipped with a furry tail and tube squeaker inside. Buckles went WILD for this toy. Even after the photos, he grabbed this and ran away to make sure he could keep it and stash it upstairs. The first of two treats bags is full of these little pork bits – the perfect size for training. Look at those eyes! He was very intense in this month’s photoshoot! These are wheat, corn, and soy-free – which we avoid with Buckles, so these are perfect. These treats are made by BARK, but I couldn’t find them in their shop. Like the first bag of treats, these are corn, wheat, and gluten-free. These are also pretty bite-size for Buckles and good for little treats or training. The last item has typically been a rawhide chew of some sort – this month we got something much more up Buckles’ alley – a beefy chew! He tried to rip it right out of my hand! It’s always surprising how strong a tiny dog can be when he really wants what you have. I made him do a little extra for it since he tried to cheat and steal it. You can tell by his eyes that he was over the moon for this treat! Verdict: This is one of the best months that we’ve had with Barkbox – the toys, treats, and chew were all hits with Buckles. That’s all I need to make me feel that the box was a winner! 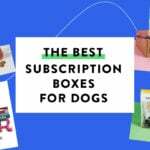 What did you think of the June 2018 BarkBox? Those multilayer toys are lost on my little boy too (6 month old cockapoo). He prefers to just carry his toys around and cuddle them. I’m tempted to cut one open though just to see what’s inside. "I think your math is off when totaling the value and cost. Maybe it was from your last review? Also, the retail ..."